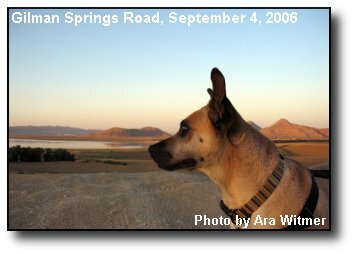 Editor's Note: Older photos are available. 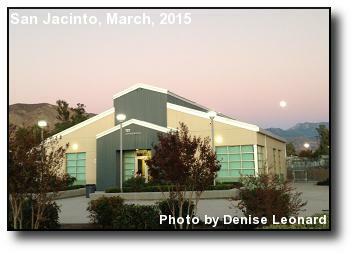 Full moon: The evening moon rises above Mountain View High School in San Jacinto. Photo courtesy of Denise Leonard. 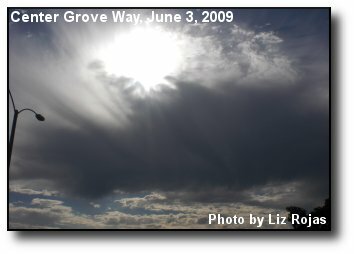 Cloud Above: Sun rays shine around a storm cloud. Photo courtesy of Ethan Leonard. 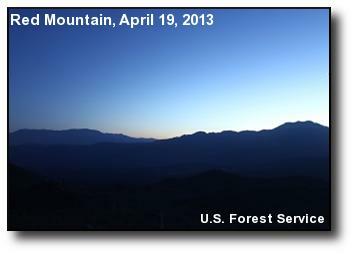 Mountains at Dawn: From Red Mountain, a webcam captures Mt. 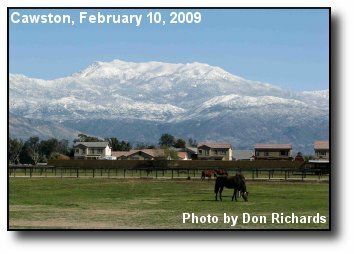 San Gorgonio and Mt. San Jacinto Photo courtesy of U.S. Forest Service. 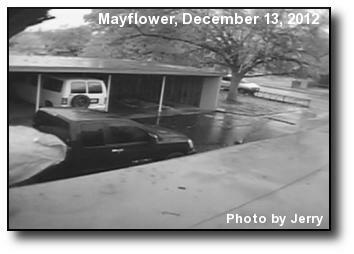 Wet Weather: This black and white photo captures conditions after a morning of constant rain. Photo courtesy of Jerry. 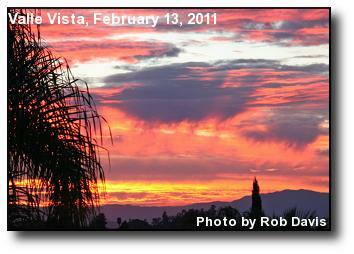 Red Sunrise: The reddish hue of dawn over the San Jacinto Valley. Photo courtesy of Mitch McGee. 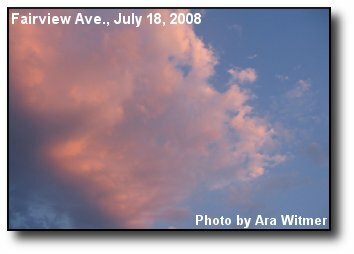 Colored Clouds: The red-orange glow of sunrise on some passing clouds. Photo courtesy of Mitch McGee. 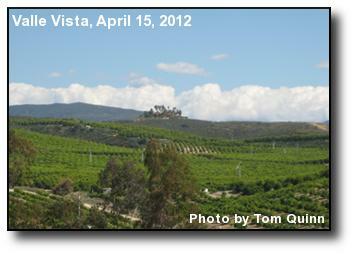 Eastern Clouds: A bank of clouds to the east of this hilltop home, among the Valle Vista citrus groves. Photo courtesy of Tom Quinn. 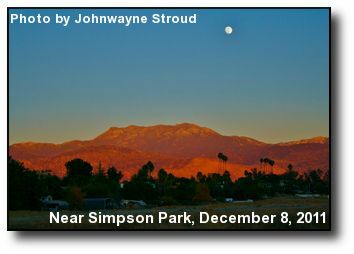 Mountain Moon: A full moon rises over Mount San Jacinto, as seen from near Simpson Park. Photo courtesy of Johnwayne Stroud. 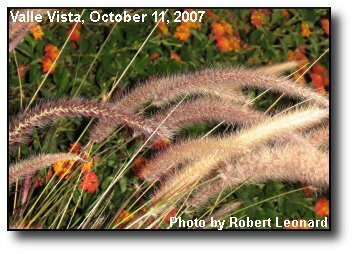 East Grove: From a wind machine, Mt. 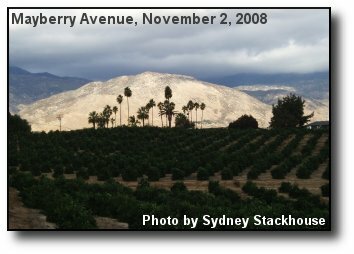 San Jacinto sits in the distance across a citrus grove. Photo courtesy of Craig Brudin. 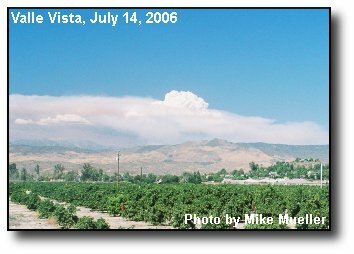 Dust storm: Strong winds conjure up a dust storm in the northern San Jacinto Valley. Photo courtesy of Rodrigo Zuazua. 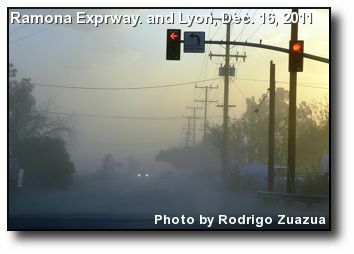 Blowing Dust: Dust obscures the roadway in the late afternoon, the result of strong northeast winds. Photo courtesy of Rodrigo Zuazua. 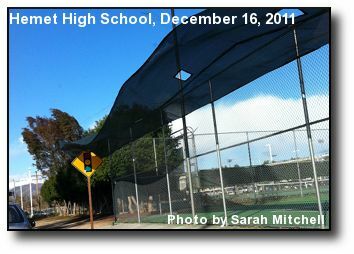 Damaging Winds: Cold northeast winds gust at Hemet High's tennis courts. Photo courtesy of Sarah Mitchell. 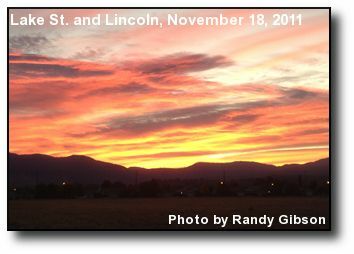 Colorful Sunrise: The sun illuminates some passing clouds in this November sunrise. Photo courtesy of Randy Gibson. 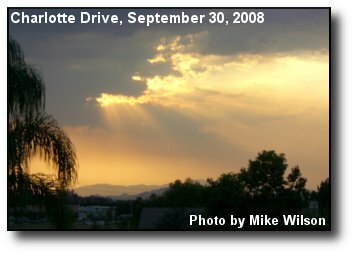 Sunshine after Rain: Sunset amongst the clouds, following a rainy day. Photo courtesy of Lisa Soto. 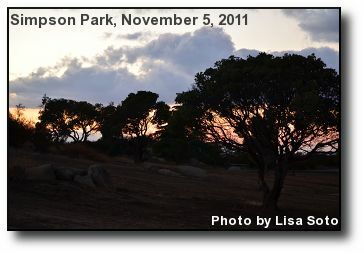 Picnic Area: Trees at Simpson Park, silhouetted by sunset after a good rain. Photo courtesy of Lisa Soto. Lake at Sunset: Diamond Valley Lake from Simpson Park, at sunset after a rainy day. Photo courtesy of Lisa Soto. 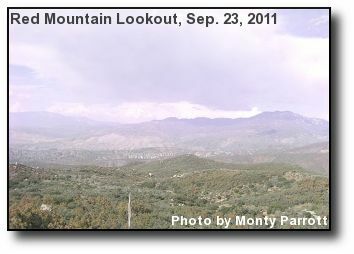 Mountain Rain: Rain falls in the distance in this view of the San Jacinto mountains. Photo courtesy of Monty Parrott. 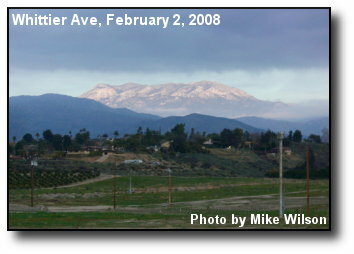 Fog over Hemet: Ground fog stretches across the San Jacinto Valley, as seen from Red Mountain. 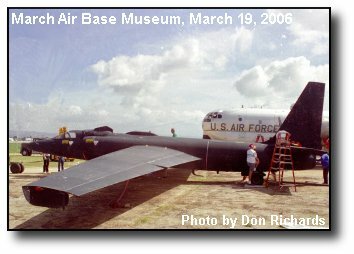 Photo courtesy of Ed Hunter. 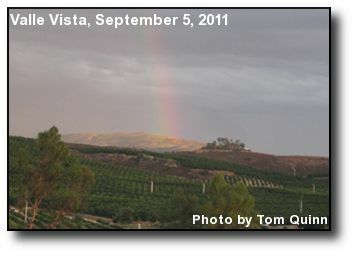 Rainbow's Descent: A rainbow decends on citrus groves in Valle Vista. Photo courtesy of Tom Quinn. 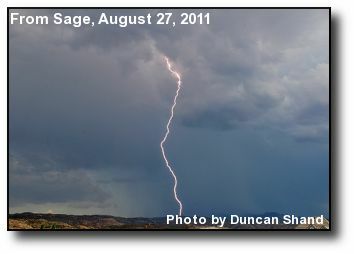 August Lightning: A bolt of lightning hits the ground somewhere in the Anza area, as seen from Sage. Photo courtesy of Duncan Shand. 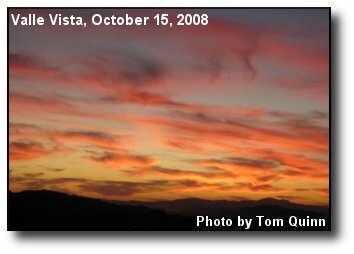 August Night: Colored clouds stream across the valley sky at sunset. Photo courtesy of Troy Standard. 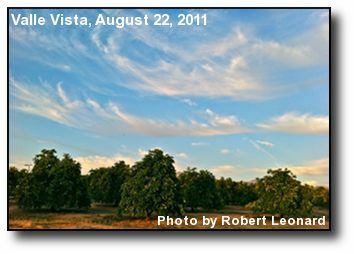 Grapefruit Groves: Wispy summer clouds float above a grapefruit grove in Valle Vista. Photo courtesy of Robert Leonard. 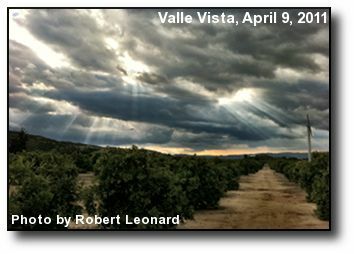 Exiting Storm: Clouds from a recent spring storm flow eastward over a Valle Vista orange grove. Photo courtesy of Robert Leonard. 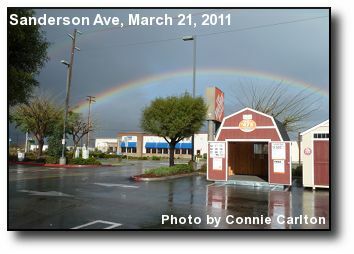 Full Rainbow: Wet weather and a bit of sunshine begets this full rainbow over some of Hemet's shopping. Photo courtesy of Connie Carlton. 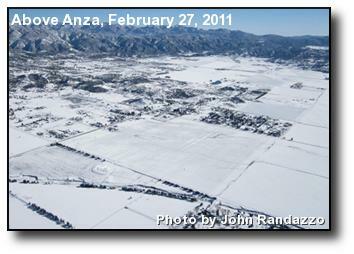 Snow Blanket: Snow covers the Anza Valley after a cold winter storm, in a view from the air. Photo courtesy of John Randazzo. 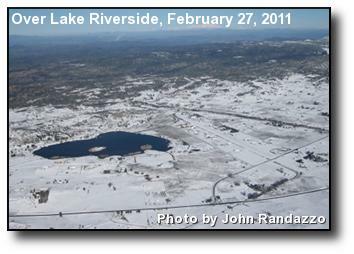 Valley Snow: An aerial view of Lake Riverside, in the Anza Valley, after snowfall. Photo courtesy of John Randazzo. 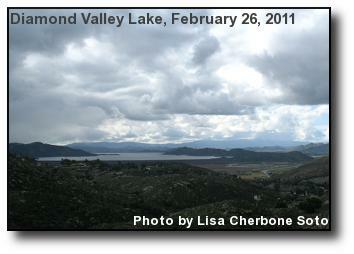 Overcast Lake: Storm clouds loom over Diamond Valley Lake. Photo courtesy of Lisa Cherbone Soto. 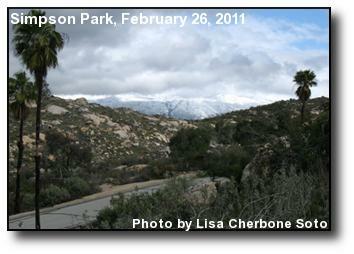 Mountain Peek: Snowfall on the San Jacinto mountains after a very cold storm. Photo courtesy of Lisa Cherbone Soto. 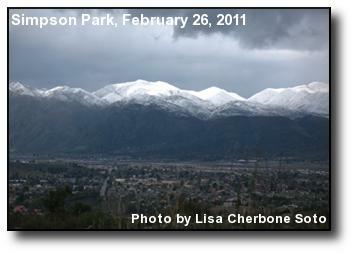 North Mountains: North of the valley, the mountains gleam white from overnight snow. Photo courtesy of Lisa Cherbone Soto. 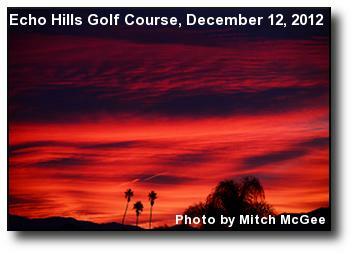 Colored Clouds: Crimson clouds after sunset in the valley sky. Photo courtesy of Troy Standard. 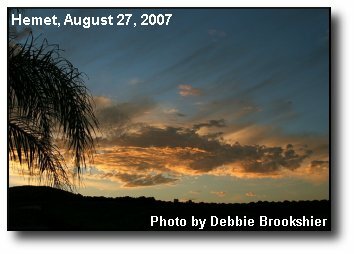 Before Sunset: Wispy clouds in the valley sky are a golden glow before sunset. Photo courtesy of Troy Standard. 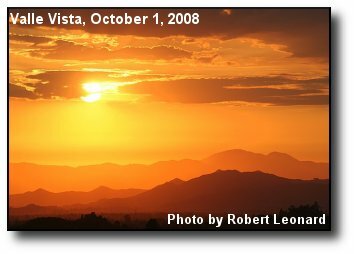 Vista Sunset: A vivid sunset across the San Jacinto Valley, from the Valle Vista area. Photo courtesy of Rob Davis. 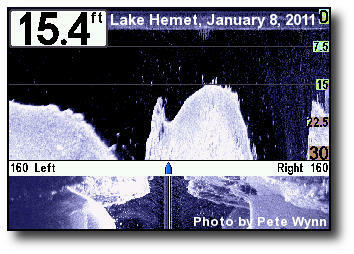 Sonar Image: An underwater view of the dam at Lake Hemet, taken with side-scanning sonar. Photo courtesy of Pete Wynn. 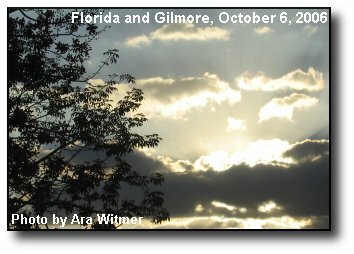 Sunset Reflection: Fair weather clouds reflecting the recently set sun. Photo courtesy of Mike Wilson. 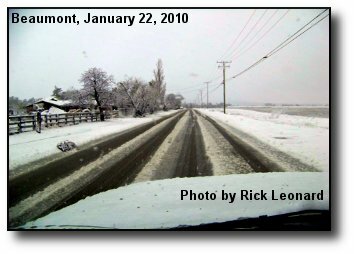 Light Dusting: The lower slopes of Mt. 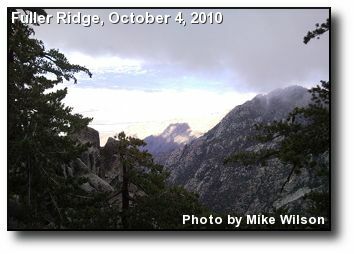 San Jacinto following recent light snow at low elevations. Photo courtesy of Troy Standard. 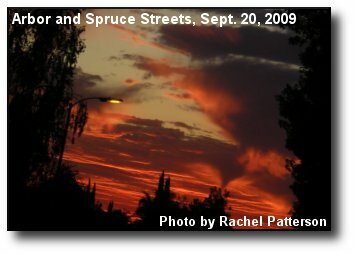 Sunset Stream: A stream of clouds flows from the west at sunset. Photo courtesy of Richard Lopez. Raging River: Runoff from heavy rains rushes down the San Jacinto River, in this scene from Valle Vista. Photo courtesy of Mike Wilson. 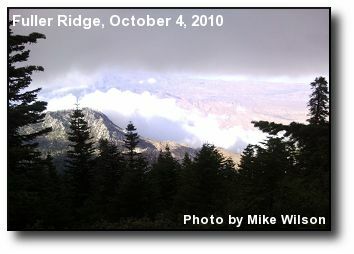 Marine Layer: Creeping up the mountains from the San Jacinto Valley, marine layer is on the way. Photo courtesy of Mike Wilson. 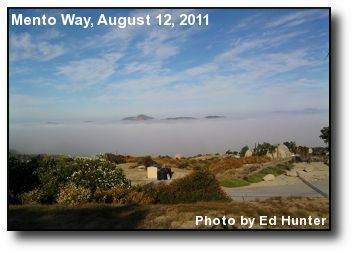 Banning Pass: From 8,000 feet up on Fuller Ridge, marine layer fills the Banning Pass. Photo courtesy of Mike Wilson. 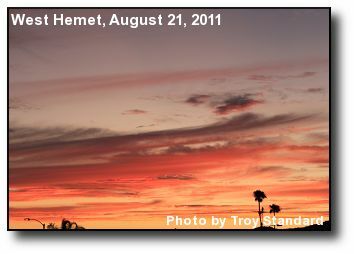 Summer Palms: Tall palm trees silhouetted against the Valle Vista sunset. Photo courtesy of Ara Witmer. 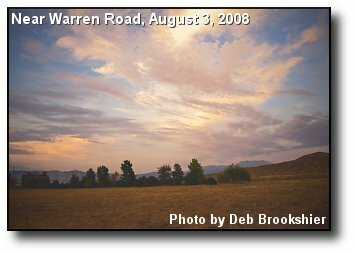 Mountain Clouds: Clouds gather atop Mt. 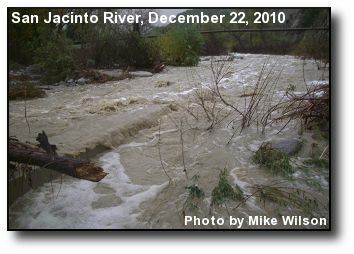 San Jacinto, courtesy of monsoonal moisture. Photo courtesy of Rodrigo Zuazua. 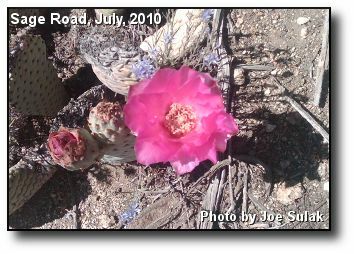 Blooming Cactus: A prickly pear cactus in full bloom, with purple flowers. Photo courtesy of Joe Sulak. 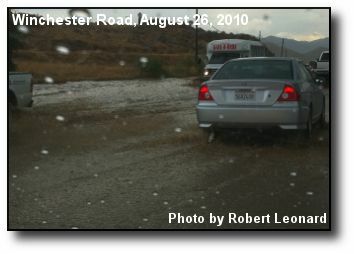 Flash Flooding: Thunderstorms leads to a flooded road in Homeland. Photo courtesy of Robert Leonard. 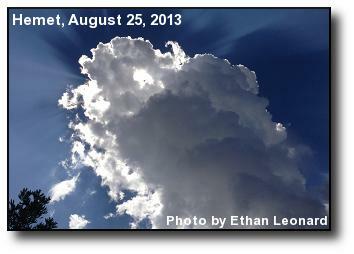 Hot August Night: Cloud remnants at sunset mark the passing of summer thunderstorms. Photo courtesy of Troy Standard. 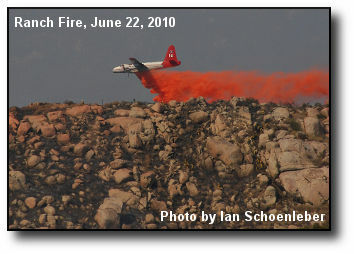 Ranch Fire: A Neptune P2V-7 (Tanker 10) making a drop on the Ranch fire, June 22, 2010. Photo courtesy of Ian Schoenleber. 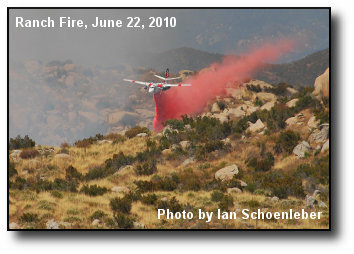 Air Drop: A CalFire S2 air tanker making a drop on the Ranch Fire, south of Hemet on June 22, 2010. Photo courtesy of Ian Schoenleber. 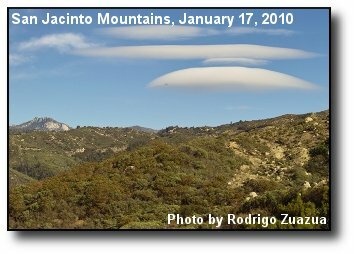 Lenticular Clouds: Mounds of clouds loom over the San Jacinto mountains before the recent rain storms. Photo courtesy of Rodrigo Zuazua. 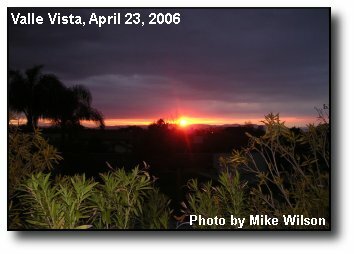 West Valley Sunset: Light glows off an array or clouds at sunset. Photo courtesy of Crystal Lopez. 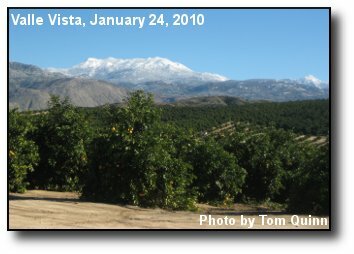 Snowpack: The San Gorgonio snowpack after the January storms, from the citrus groves in Valle Vista. Photo courtesy of Tom Quinn. Snow Peaks: A view of snow capped Mt. 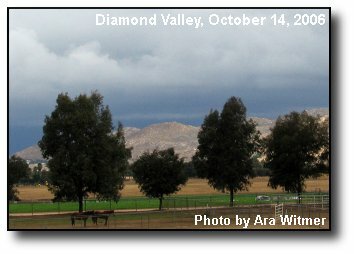 San Jacinto and Tahquitz Peak, from the Valle Vista citrus groves. Photo courtesy of Tom Quinn. 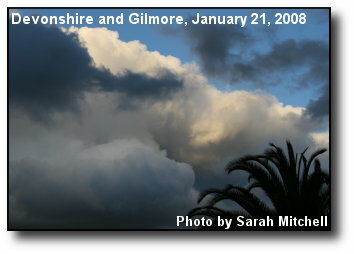 Setting Sun: The setting sun illuminates the last post-frontal cumulus as they leave the area. Photo courtesy of Mike Wilson. 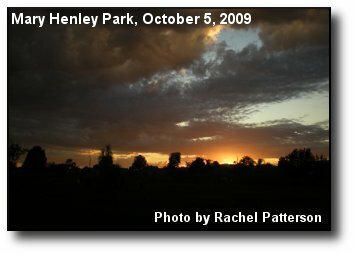 Clouds and Sunset: The sky darkens above Mary Henley Park in the west Hemet area. Photo courtesy of Rachel Patterson. 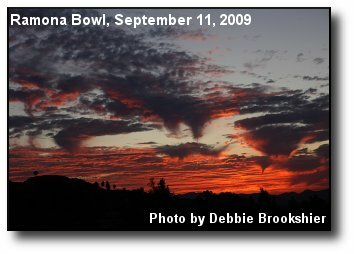 Valley Virga: A few virga cones over the San Jacinto Valley on an autumn evening. Photo courtesy of Robert Leonard. 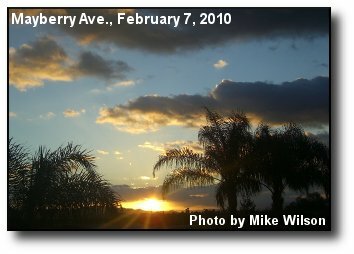 Seven Hills Sunrise: Small clouds curve across the sky sunrise over the Seven Hills community. Photo courtesy of Susan Roberts. 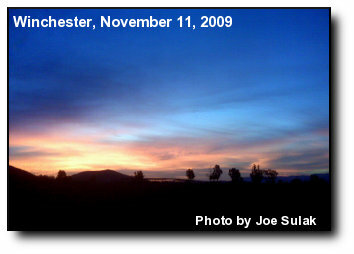 Morning Light: The beginnings of morning in the Winchester area. Photo courtesy of Joe Sulak. 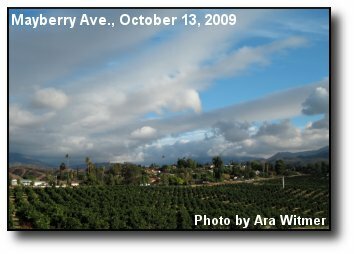 Parting Clouds: Evening clouds appear to part above a valley orange grove. Photo courtesy of Ara Witmer. 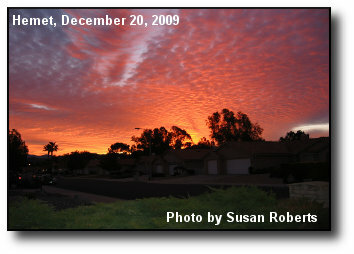 Illuminated Clouds: Clouds are like red and orange bumps and funnels in the sky at sunset. Photo courtesy of Debbie Brookshier. 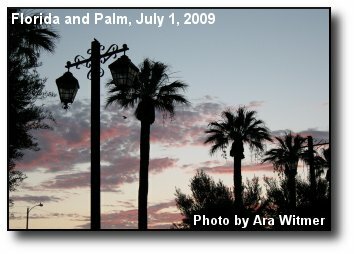 Sunset Palms: Palms line the sky at sunset. Photo courtesy of Jane Holguin. 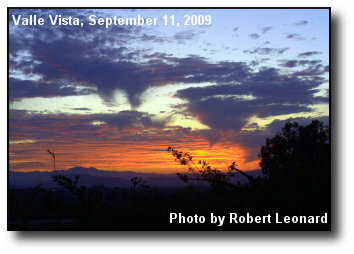 Morning Clouds: An array of clouds over the valley in the early morning. Photo courtesy of Ara Witmer. 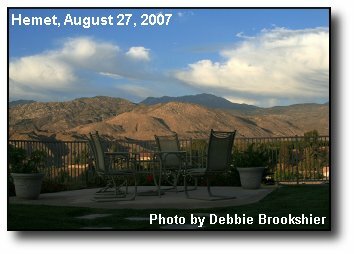 Santiago Peak: A view to the west of Santiago Peak and the foothills lining the San Jacinto Valley at sunset. Photo courtesy of Robert Leonard. Extraordinary Sunset: A streetlight puncuates the fading sunlight. Photo courtesy of Rachel Patterson. 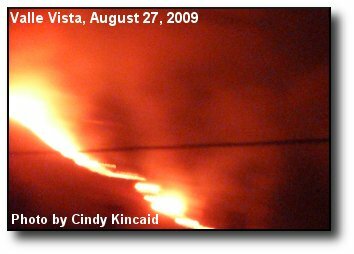 Cottonwood Fire: A view of the flames from August's fire in Cottonwood Canyon. Photo courtesy of Cindy Kincaid. 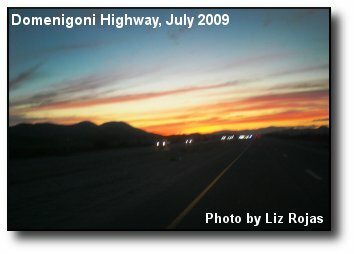 Sunset Lights: Car lights mixed with the fading colors of dusk on the Domenigoni Highway. Photo courtesy of Liz Rojas. 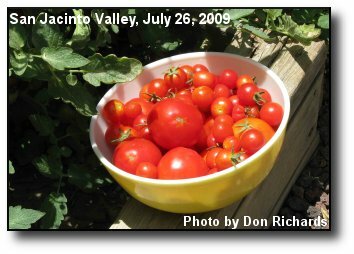 Bumper Crop: It was a great year for tomatoes in the San Jacinto Valley. Photo courtesy of Don Richards. 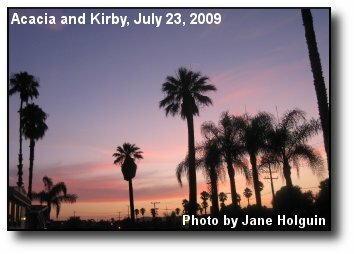 Palms at Dawn: Palm trees in the foreground of a dawn sky in Hemet. Photo courtesy of Ara Witmer. 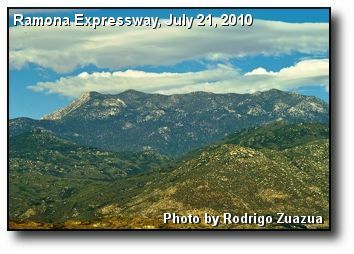 Pass and Valley: A morning view of Banning Pass in the foreground and the San Jacinto Valley in the background, from the summit of Mt. 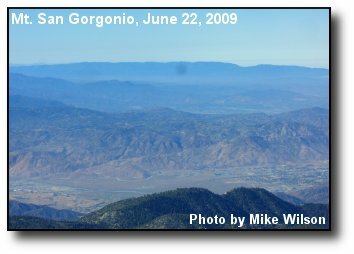 San Gorgonio. Photo courtesy of Mike Wilson. 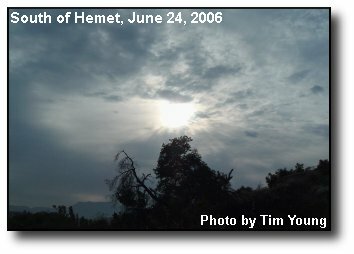 Sky Shine: Sun shines through some valley clouds as seen from San Jacinto. Photo courtesy of Liz Rojas. 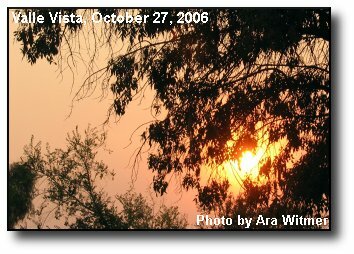 Driveway Sunset: The setting sun obscures groves of trees with orange light. Photo courtesy of Craig Brudin. 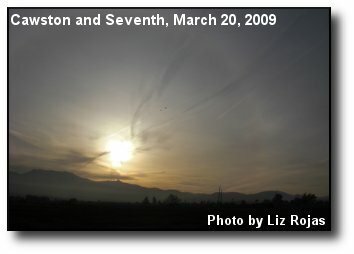 Sky Trails: Contrails mix with the sun, clouds and mountains in the morning sky. Photo courtesy of Liz Rojas. 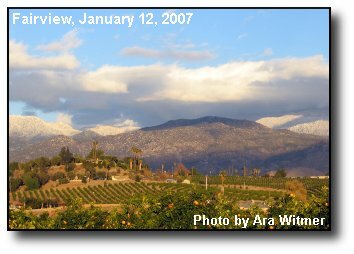 Mountain Snow: A tranquil valley scene looking east to the snow-capped Mount San Jacinto. Photo courtesy of Don Richards. 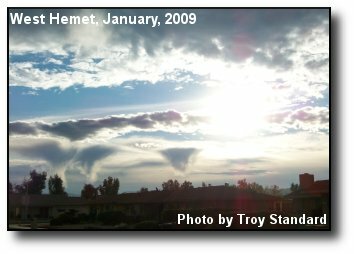 Cloud Formations: Different cloud formations, shaped by prevailing winds, in the San Jacinto Valley sky. Photo courtesy of Troy Standard. 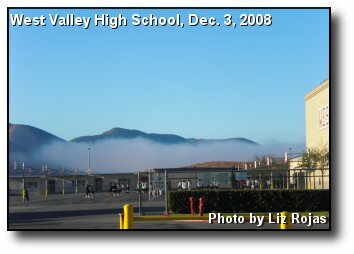 Morning Fog: Low-lying fog retreating at the west end of the valley. Photo courtesy of Liz Rojas. 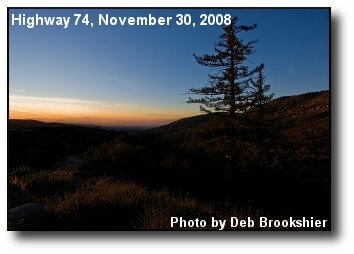 Highway Sunset: A pine tree and the San Jacinto Valley on the way back from Idyllwild. Photo courtesy of Deb Brookshier. 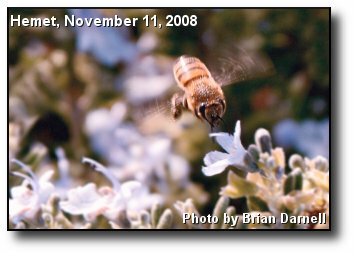 Garden Buzz: A bee at work near a local Hemet hotel. Photo courtesy of Brian Darnell. 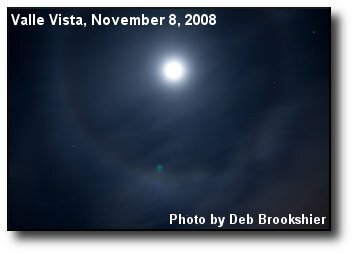 Moon Ring: Autumn clouds create a ring around the moon, as seen from Valle Vista. Photo courtesy of Deb Brookshier. 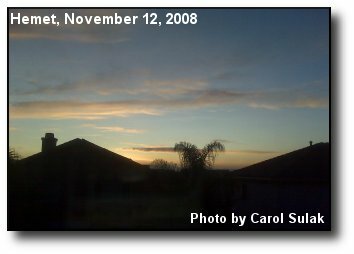 Porch Sunrise: Morning sunrise behind neighborhood rooftops. Photo courtesy of Carol Sulak. 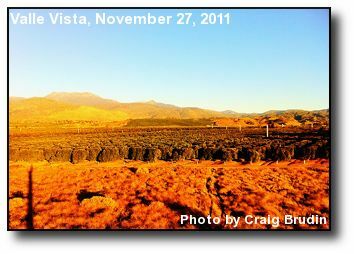 Grapefruit Orchard: Rows of grapefruit trees against the dry foothills of Valle Vista. Photo courtesy of Sydney Stackhouse. 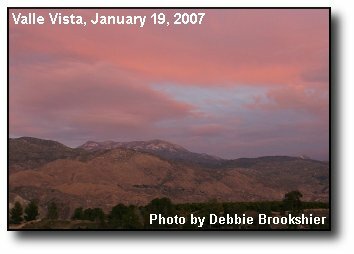 Beautiful Morning: Clouds and mountains at sunrise from San Jacinto Tamarisk Ranch. Photo courtesy of Liz Rojas. 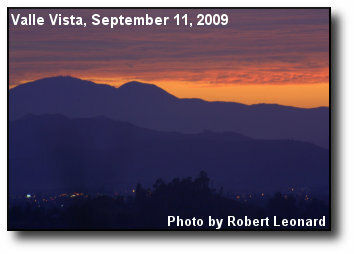 Twilight Color: Wispy bands of color over the valley at sunset. Photo courtesy of Tom Quinn. 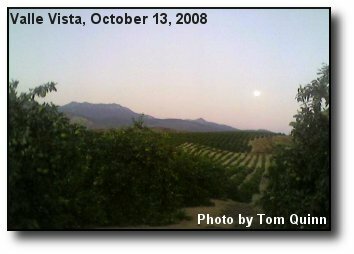 Moon Rise: The moon rises over the San Jacinto mountains and Valley Vista citrus groves. Photo courtesy of Tom Quinn. 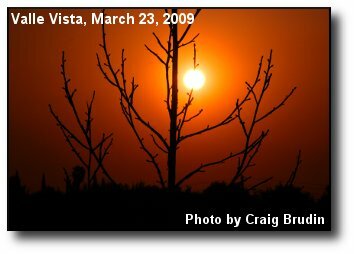 Sunset Shades: Clouds, sky and hills are shades of orange and yellow for a valley sunset. Photo courtesy of Robert Leonard. 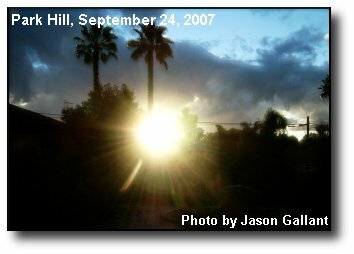 Light Hole: Sunlight finds its way through a break in the clouds. Photo courtesy of Mike Wilson. 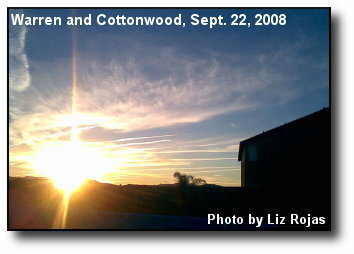 Summer Evening: The setting sun on a summer evening, illuminating clouds and contrails. Photo courtesy of Liz Rojas. 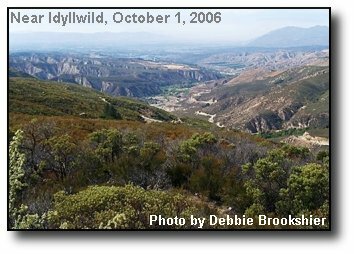 Summit View: Diamond Valley Lake and citrus groves are visible in this picture from the summit of Mt. 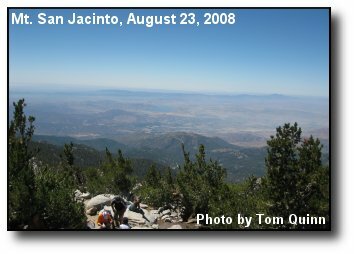 San Jacinto, elevation 10,834 feet. Photo courtesy of Tom Quinn. 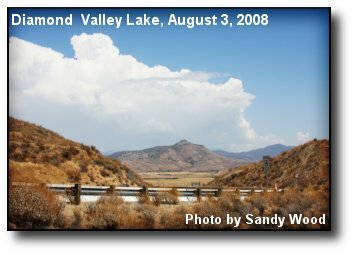 Valley Clouds: A view of foothills and thunderheads in around the San Jacinto Valley, from Diamond Valley Lake. Photo courtesy of Sandy Wood. 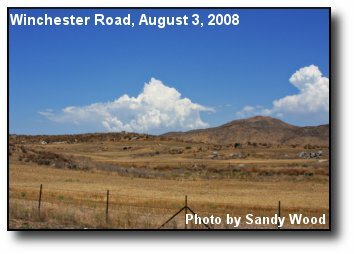 Winchester Hills: Dry foothills near Diamond Valley Lake, off of Winchester Road. Photo courtesy of Sandy Wood. 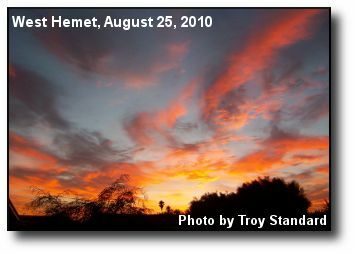 Summer Sky: A colorful set of clouds at sunset, contrasted against a San Jacinto Valley meadow. Photo courtesy of Deb Brookshier. 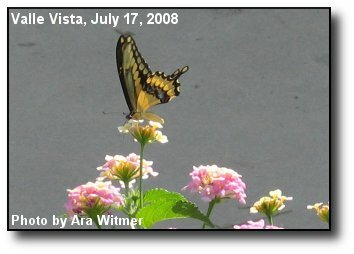 Giant Swallowtail: A Giant Swallowtail butterfly visits lantana blossoms in a Valle Vista yard. Photo courtesy of Ara Witmer. 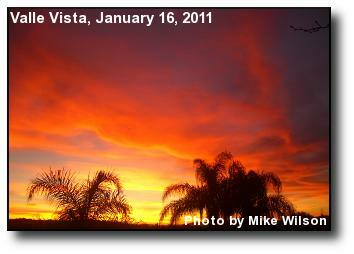 Dawn Clouds: The red glow of morning sunrise on some clouds in the valley sky. Photo courtesy of Ara Witmer. 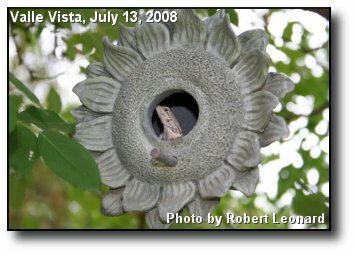 Garden Lord: This lizard commands the garden from a fancy lookout. Photo courtesy of Robert Leonard. 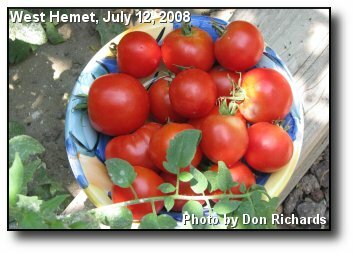 Home Grown: This bountiful tomato harvest comes from a West Hemet backyard. Photo courtesy of Don Richards. 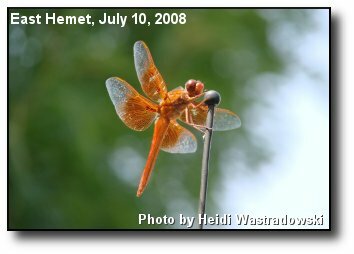 Antenna Attraction: A dragonfly rests from fitful flight on an East Hemet car antenna. Photo courtesy of Heidi Wastradowski. 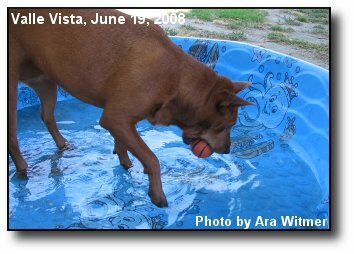 Cooling Off: A hot dog cools off in a wading pool in a triple digit day in the San Jacinto Valley. Photo courtesy of Ara Witmer. 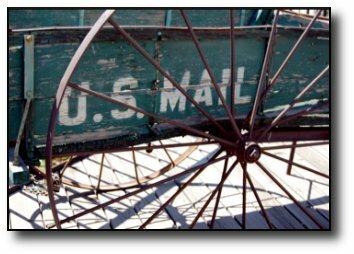 Bygone Days: A reflection of slower days at the Hemet Museum. Photo courtesy of Lisa Draper. 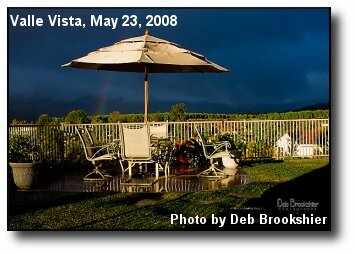 Storm View: A pleasant backyard view of a rainbow and clouds from the May thunderstorms. Photo courtesy of Deb Brookshier. 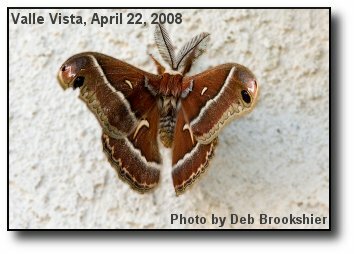 Silk Moth: A large Ceanothus Silk Moth, common in the area, clings to a ceiling. Photo courtesy of Deb Brookshier. 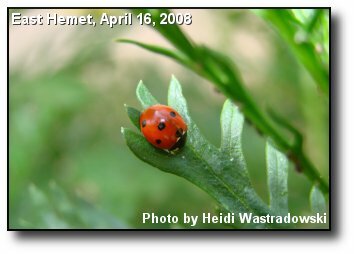 Valley Ladybug: Sitting on leaf, this ladybug was feasting on some aphids in an East Hemet backyard. Photo courtesy of Heidi Wastradowski. 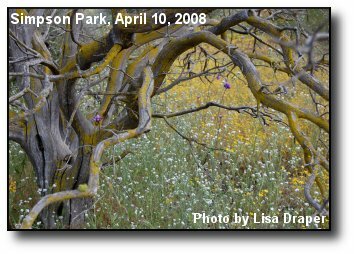 Rustic View: Springtime flowers and tree moss on the Crest Trail in Simpson Park. Photo courtesy of Lisa Draper. 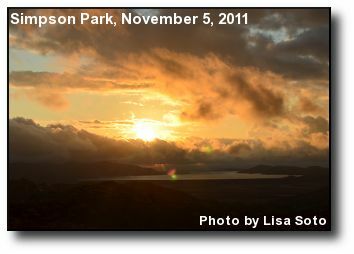 Simpson Park: A view of Mt. 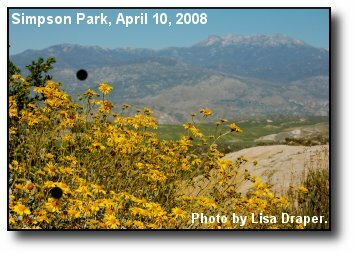 San Jacinto and wild daisies from Simpson Park in East Hemet. Photo courtesy of Lisa Draper. 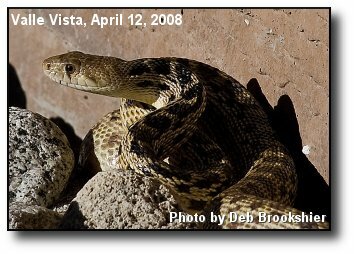 Gopher Snake: This snake wandered onto a street in Valle Vista, was found by Heather Brookshier, then captured by Bob Hamilton and taken to safety. Photo courtesy of Deb Brookshier. 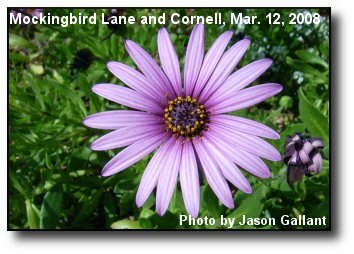 Spring Color: Flowers blooming in Valle Vista add seasonal color to the valley. Photo courtesy of Jennifer Apffel. 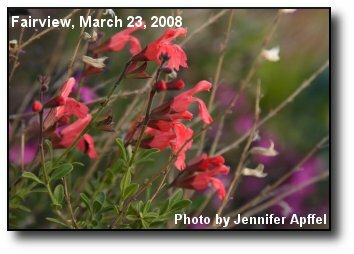 Spring Bloom: A flower opens to the San Jacinto Valley sky. Photo courtesy of Jason Gallant. 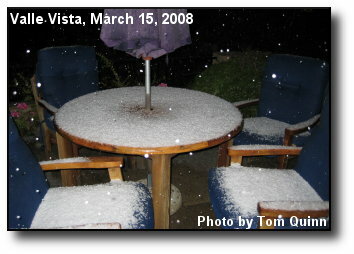 White Surprise: Frozen rain and hail accumulates on some patio furniture in Valle Vista. Photo courtesy of Tom Quinn. 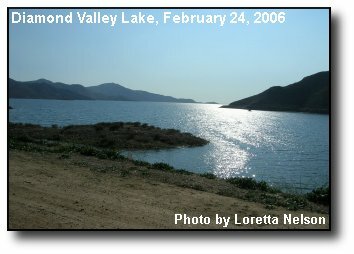 Lake Trail: Diamond Valley Lake and the local foothills unfold from an adjacent trail. Photo courtesy of Deb Brookshier. 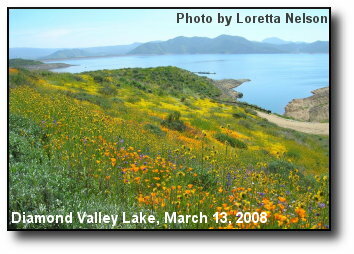 Flower Hill: From Diamond Valley Lake, one of the hills is packed with myriad blooming wildflowers. Photo courtesy of Deb Brookshier. 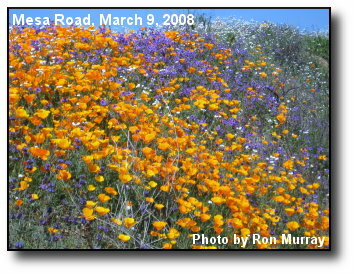 Road Wildflowers: Golden poppies and assorted wildflowers along Mesa Road, east of Temecula and Murrieta and south of Hemet. Photo courtesy of Ron Murray. 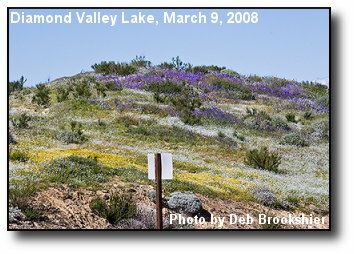 Lake Wildflowers: Wildflowers adorn a trail near the marina at Diamond Valley Lake. Photo courtesy of Loretta Nelson. 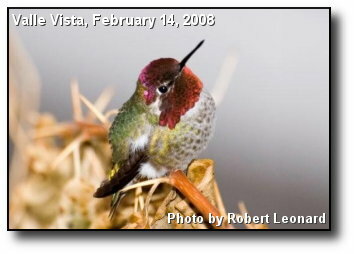 Hummingbird Perch: A content, well-fed hummingbird takes a rest. Photo courtesy of Robert Leonard. 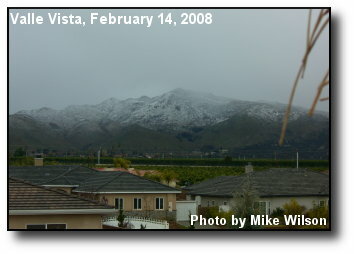 Snowstorm: The final remnants of a Valentine's Day snow storm on the foothills above Valle Vista. Photo courtesy of Deb Brookshier. 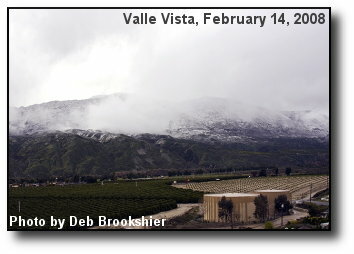 Foothill Snow: Snow covers the foothills south of Valle Vista after the cold Valentine's Day storm. Photo courtesy of Mike Wilson. Mountain Vista: Clouds preceeding the latest storm begin to fill the sky. Photo courtesy of Mike Wilson. Bowl View: A look at Mt. 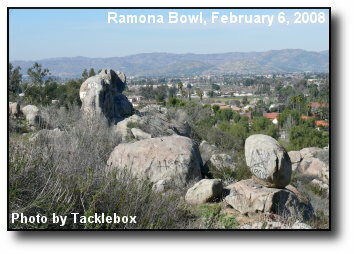 San Antonio across the valley from the Ramona Bowl parking lot. Photo courtesy of Tacklebox. 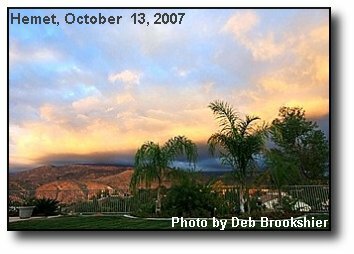 Stormy Sky: At dusk, multiple layers of storm clouds and a glimpse of daylight over the San Jacinto Valley. Photo courtesy of Sarah Mitchell. 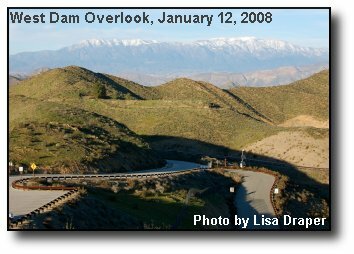 Gorgonio View: A view of the snow-topped San Gorgonio Mountains, as seen from Diamond Valley Lake's west dam overlook. Photo courtesy of Lisa Draper. 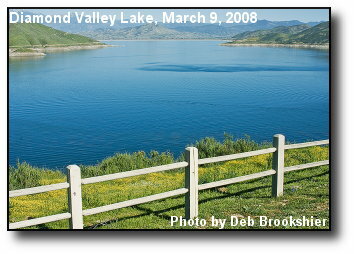 Lake Overlook: An eastern look at blue Diamond Valley Lake, to Mt. San Jacinto in the distance. Photo courtesy of Lisa Draper. 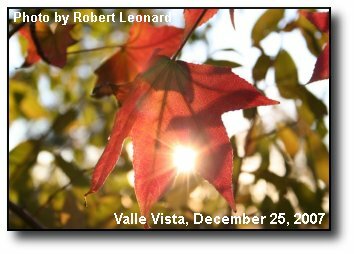 Hanging On: Sun shines through the last leaves of the season on this Liquid Amber tree. Photo courtesy of Robert Leonard. 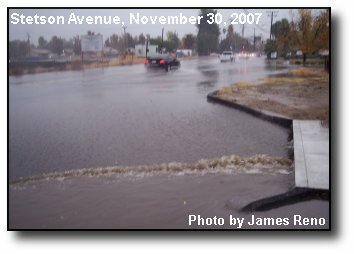 Local Flooding: A storm drain in Hemet can't handle the runoff from a November drenching. Photo courtesy of James Reno. 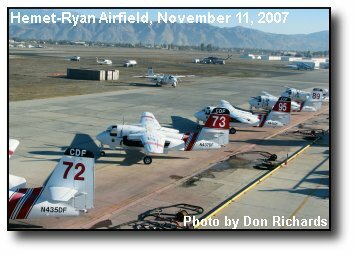 CDF Squadron: S2-Trackers and CDF Tankers lined up at Hemet-Ryan Field, as seen from the control tower. Photo courtesy of Don Richards. 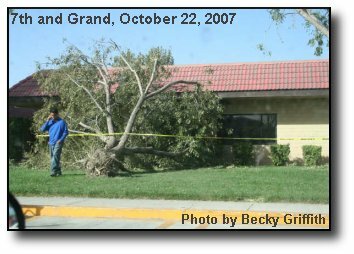 Uprooted Tree: One of many in San Jacinto after a Santa Ana-induced sandstorm. Photo courtesy of Becky Griffith. Sunset Glow: Clouds on the western horizon glow at sunset. Photo courtesy of Deb Brookshier. Dawn Blooms: Backyard scenery greets an autumn morning. Photo courtesy of Robert Leonard. Backyard Sunset: The evening sun shines between exiting storm clouds. Photo courtesy of Jason Gallant. 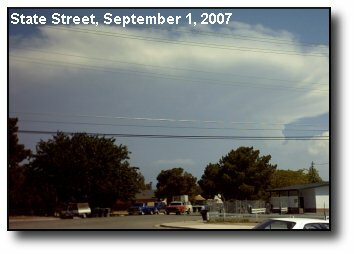 Looming Storm: A severe thunderstorm over Palm Springs, as seen from central San Jacinto. Photo courtesy of San Jacinto Weather. 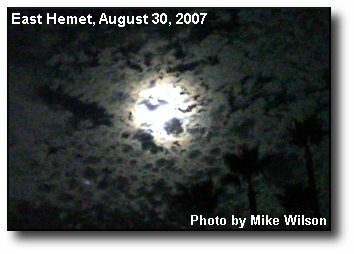 Spooky Moon: Moonlight eerily permeates leftover cirrus clouds from monsoonal moisture. Photo courtesy of Mike Wilson. 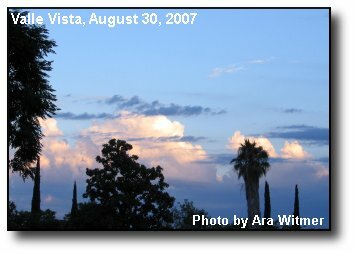 Morning Thunderheads: Remnants of a nighttime lightning show exit the San Jacinto Valley to the west. Photo courtesy of Ara Witmer. Patio View: Wispy clouds draft the local mountains on a summer evening. Photo courtesy of Debbie Brookshier. 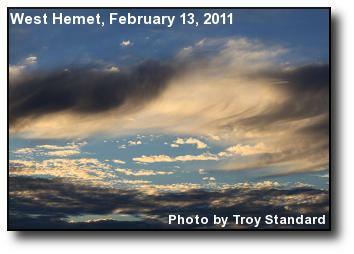 Sunset Colors: The last rays of sunlight pierce a cloud formation in the valley sky. Photo courtesy of Debbie Brookshier. 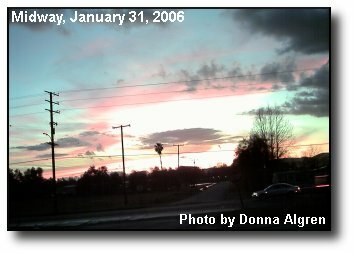 Enlightened Sky: Sunset light colors clouds to the horizon. Photo courtesy of Debbie Brookshier. 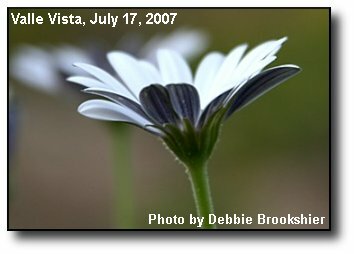 African Bloom: A white African Daisy opens to daylight. Photo courtesy of Debbie Brookshier. 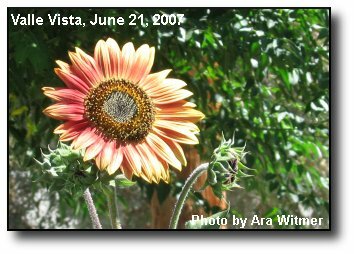 Solstice Sunflower: A single sunflower greets the Summer Solstice from a garden in Valle Vista. Photo courtesy of Ara Witmer. 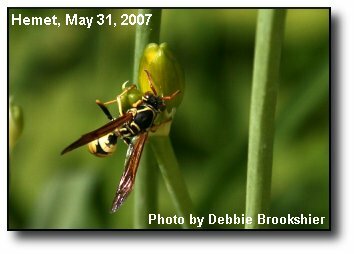 Spring Pollinator: Daylily blossoms aren't yet revealing their treasures to this impatient wasp. Photo courtesy of Debbie Brookshier. 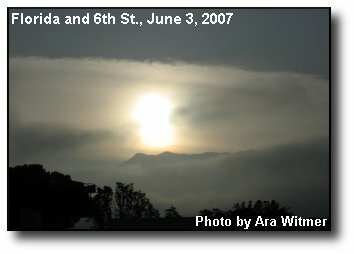 Misty Sunrise: Sunrise above the San Jacinto mountains glows through the morning fog. Photo courtesy of Ara Witmer. 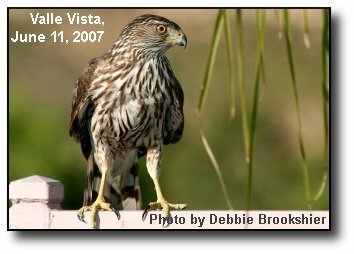 Alert Predator: A Cooper's Hawk resolutely looks for food in Valle Vista. Photo courtesy of Debbie Brookshier. 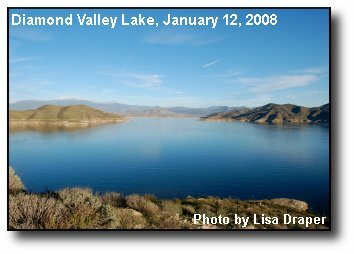 Lake Panorama: A view from the trail at Diamond Valley Lake. Photo courtesy of Debbie Brookshier. 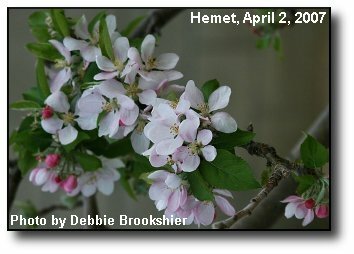 Apple Blossoms: Blooms on an apple tree signal summer fruit. Photo courtesy of Debbie Brookshier. 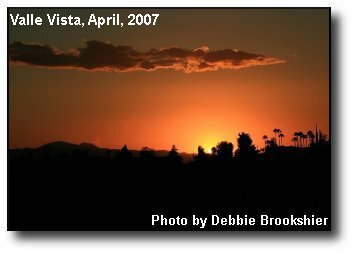 Sundown: Evening light catches a cloud lazily making its way across the valley sky. Photo courtesy of Debbie Brookshier. 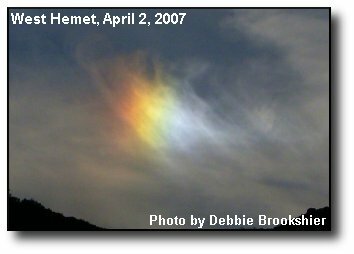 Sun Dog: Formed from light refracting off ice crystals, this sun dog appeared in the western sky. Photo courtesy of Debbie Brookshier. 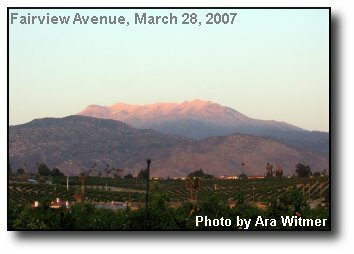 Evening Snowcap: A light dusting of snow on Mt. 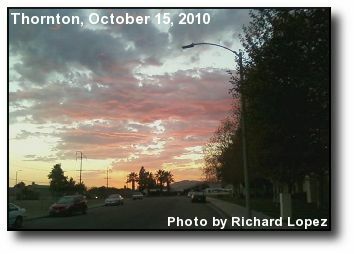 San Jacinto fades into the evening twilight. Photo courtesy of Ara Witmer. 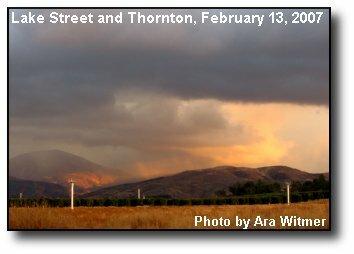 Distant Downpour: Late afternoon rain bursts from clouds over the hills southeast of Hemet. Photo courtesy of Ara Witmer. 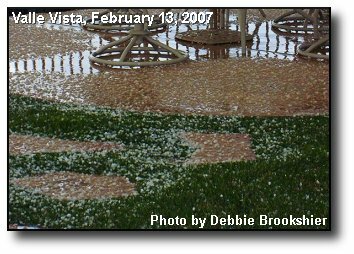 Melting Hail: A recent hailstorm leaves a Valle Vista backyard full of ice pellets. Photo courtesy of Debbie Brookshier. 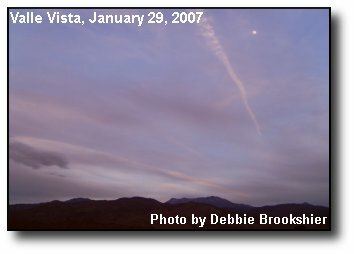 Purple Sky: A contrail, the moon, and clouds mixed in blue and purple twilight. Photo courtesy of Debbie Brookshier. 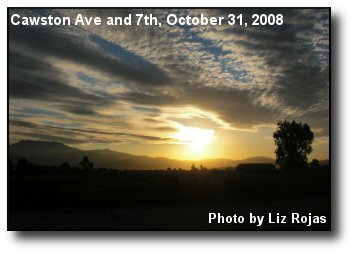 Mountain Sunset: The foothills and Mt. 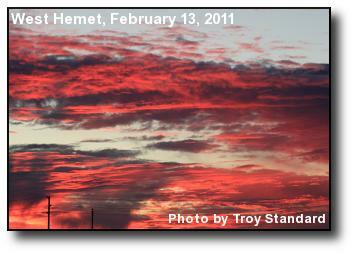 San Jacinto, and storm clouds, tinted red at sunset. Photo courtesy of Debbie Brookshier. 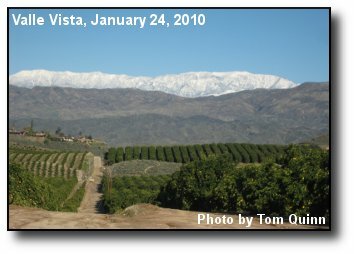 New Snow: The San Jacintos are covered white in contrast with Valle Vista's orange groves. Photo courtesy of Ara Witmer. 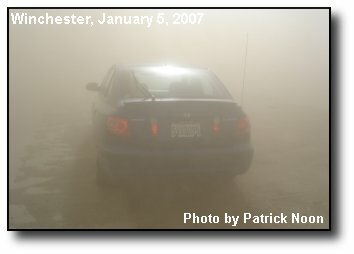 Dust Storm: Dust from Santa Ana winds engulfs this car on 9th Avenue, south of Simpson Road in Winchester. Photo courtesy of Patrick Noon. 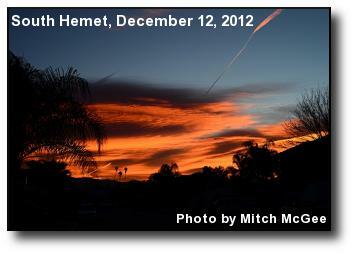 Christmas Sky: Wispy clouds mark a sunny Christmas morning near Lake Perris. Photo courtesy of Don Christiano. 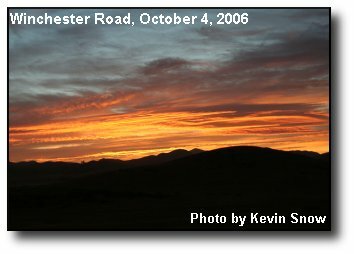 Morning Glory: The blaze of a morning sunrise as seen from Winchester Road. Photo courtesy of Kevin Snow. 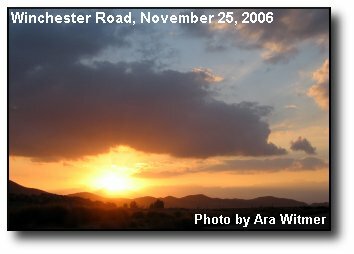 Winchester Sunset: The sun peers through the clouds near sunset in Winchester. Photo courtesy of Ara Witmer. 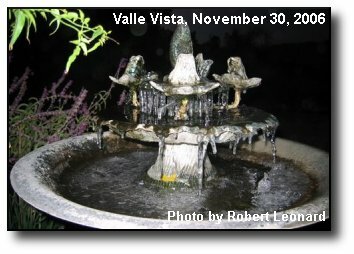 Morning Icicles: Icicles form on a fountain on a recent freezing morning. Photo courtesy of Robert Leonard. 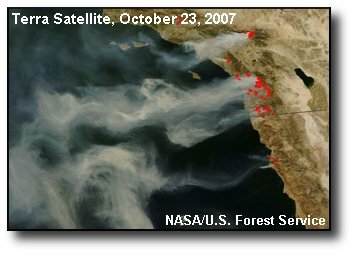 Smoky Omen: Smoke from the Esparaza Fire darkens half the sky. Photo courtesy of Debbie Brookshier. 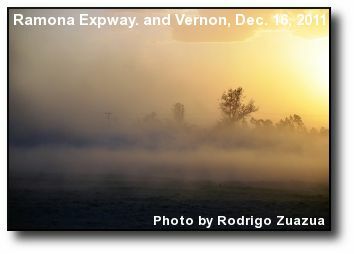 Morning Haze: The day after the beginning of the Esparanza Fire, smoke and haze sours the morning sun. Photo courtesy of Ara Witmer. 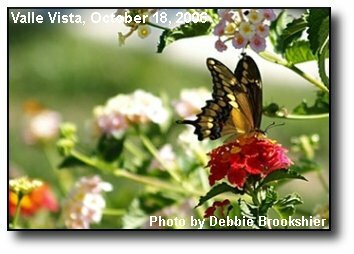 Fall Butterfly: A gold and black butterfly spreads its wings amongst autumn color. Photo courtesy of Debbie Brookshier. 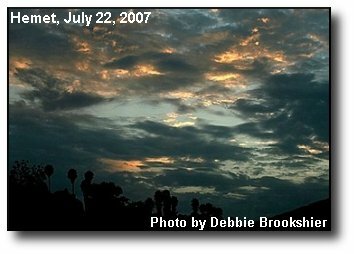 Storm Clouds: Gathering above the San Jacinto Valley, storm clouds dominate the morning sky. Photo courtesy of Ara Witmer. 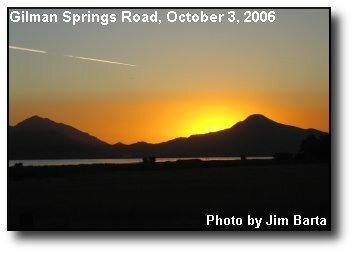 Mountain Glow: The hidden sun silhouettes the hills near the ephemeral Mystic Lake. Photo courtesy of Jim Barta. 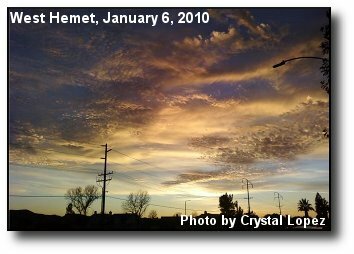 Late Day Clouds: The sun glows from behind afternoon clouds, as seen from central Hemet. Photo courtesy of Ara Witmer. 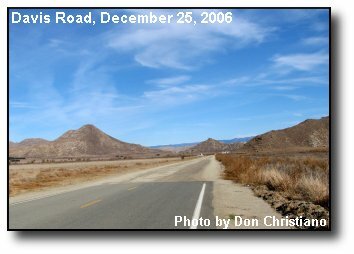 Valley View: A view of the San Jacinto Valley from up on State Route 74. Photo courtesy of Debbie Brookshier. 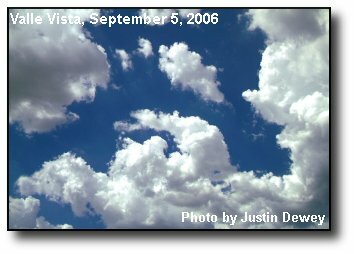 Monsoonal Clouds: From directly overhead, a smattering of clouds against the September sky. Photo courtesy of Justin Dewey. 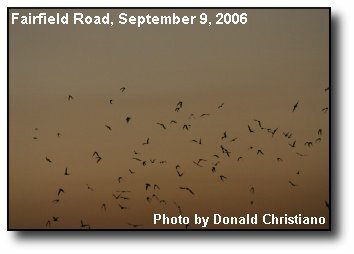 Bats at Dusk: Bats scatter from the overpass on Fairfield Road. Photo courtesy of Donald Christiano. 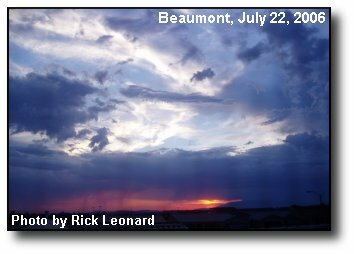 Summer Sunset: From Beaumont, a view of exiting thunderclouds after the hottest day this decade. Photo courtesy of Rick Leonard. 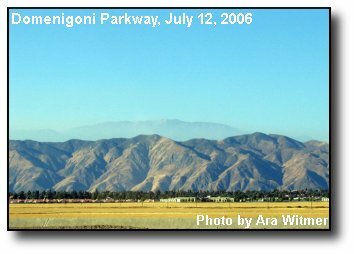 North View: Across the San Jacinto Valley, San Gorgonio rises above the valley foothills. 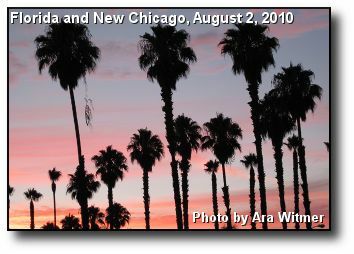 Photo courtesy of Ara Witmer. 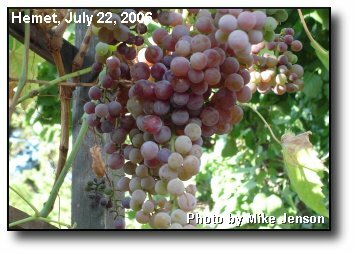 Backyard Grapes: This backyard harvest might be later than normal due to excessive heat. Photo courtesy of Mike Jenson. 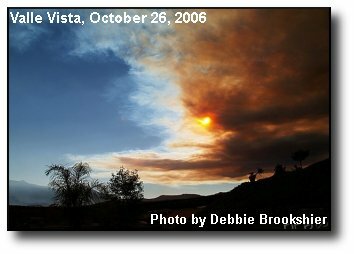 Yucca Fire: Smoke from the Yucca Fire mixes with a thunderhead backdrop. Photo courtesy of Mike Mueller. 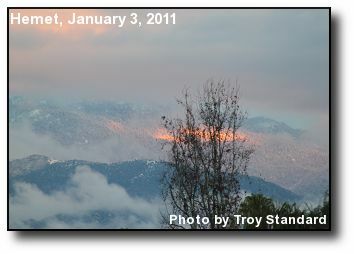 Pollybutte Spotlight: The morning sun attempts to break through the clouds near Pollybutte, south of Hemet. Photo courtesy of Tim Young. 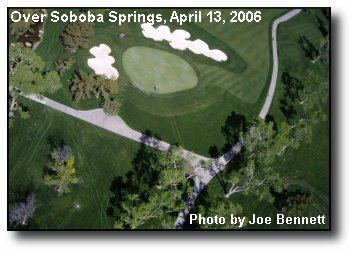 Green View: A lone worker toils on a green at the Soboba Springs Royal Vista Golf Course, taken from remote control airplane. Photo courtesy of Joe Bennett. Peeking Sun: The setting sun peeks under a spring storm canopy. Photo courtesy of Mike Wilson. 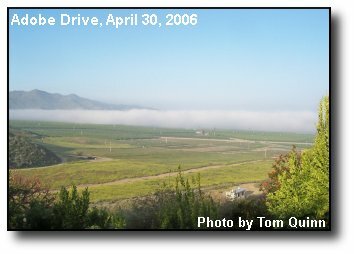 Advancing Clouds: A thin marine layer moves into the Valle Vista citrus groves. Photo courtesy of Tom Quinn. 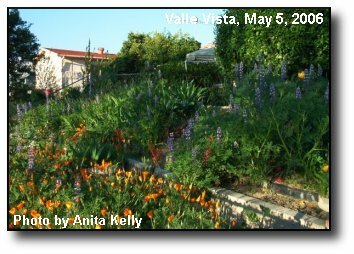 Spring Flowers: Iris and poppies rise from a Valle Vista backyard. Photo courtesy of Anita Kelly. 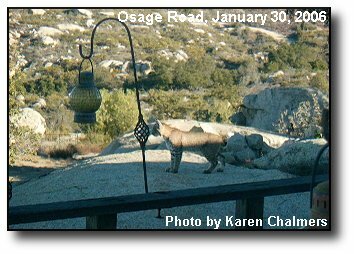 Sage Bobcat: A bobcat kitten visits a yard in Sage. Photo courtesy of Karen Chalmers. 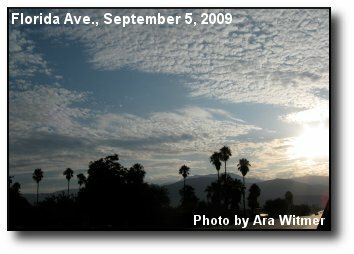 Cloudy Sunset: A view of the sunset, looking west towards San Jacinto Avenue. Photo courtesy of Donna Algren. 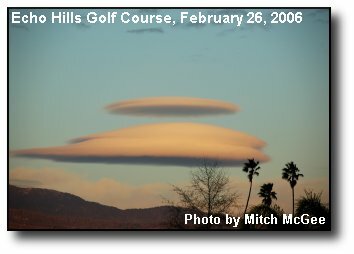 Cloud Formation: Round clouds cruise over Thomas Mountain near Hemet. Photo courtesy of Mitch McGee. 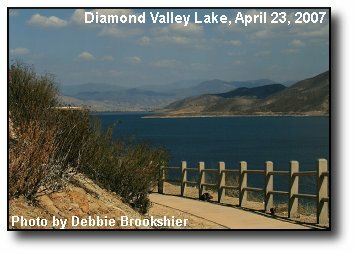 Lake Trail: The bike path meanders around the lakeshore on a clear day at Diamond Valley Lake. Photo courtesy of Loretta Nelson. 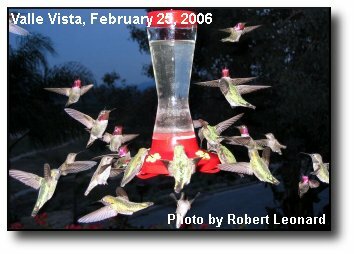 Happy Hummingbirds: A swarm of hummingbirds shows up for a feeding in Valle Vista. Photo courtesy of Robert Leonard. 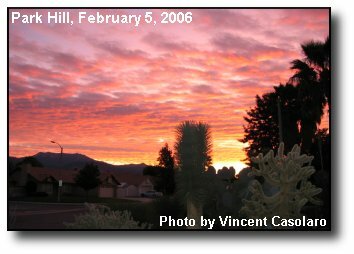 San Jacinto Sunrise: Morning color illuminates clouds and cactus in San Jacinto. Photo courtesy of Vincent Casolaro. 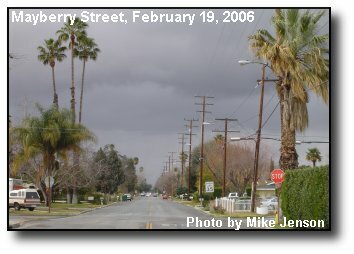 Stormy Street: A westerly view reveals an oncoming storm in Hemet. Photo courtesy of Mike Jenson. 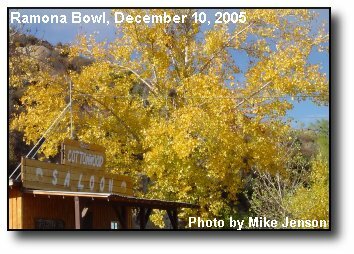 Yellow Cottonwood: Cottonwood trees show fall colors at the Ramona Bowl in Hemet. 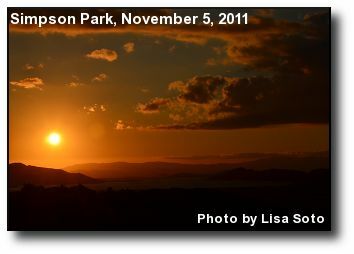 Photo courtesy of Mike Jenson.